On 22 June, 602 Christians reconverted to Hinduism in the Indian state of Odisha. The event was organised by the ‘Hindu Jagran Samukhya,’ and took place in the presence of the Shankaracharya of Puri, who blessed the reconverted persons and delivered a speech on basic principles of the Hindu religion. The reconverted persons included 207 men, 180 women and 215 children. Various Hindu organisations throughout India have been holding ‘reconversion parties’ in the last few years. Most Hindus dislike the idea of people trying to convert others to their own religion. It is seen as devaluing religion, turning it into a power struggle that has nothing to do with true spirituality. Up until quite recently, Hindus very rarely tried to convert others. That is not to say that Hinduism was totally closed entry, but there was never a systematic attempt to draw people from other religions into Hinduism. However, the conversion of Hindus to other religions has indeed ruffled the feathers of many Hindus. 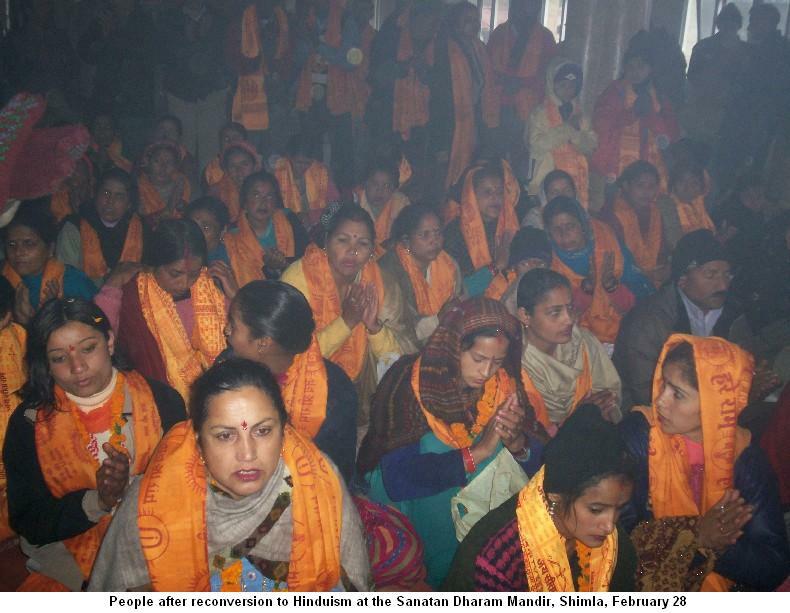 The gradual decline in the percentage Hindu population in India has spurred certain Hindu groups into action, to launch what they see as a long overdue counterattack to bring back ‘lost Hindus’ back into the fold. Critics have pointed out that Hindus still comprise the overwhelming majority of India’s population, and therefore it is mindless paranoia to believe that there is any real risk to the survival of Hinduism. On the other hand, it must be conceded that if other religions are granted the right to try and spread their religion, Hindu groups cannot be blames for doing the same. Most Hindus say that they have no problem if a Hindu makes a personal decision to follow another religion. But it is constant and systematic attempts to convert large numbers of Hindus that causes resentment. Article written in 2007. Details of more recent re-conversion events can be found here. « Hindu tolerance throughout history: fact or myth?